Providing employees with comprehensive training is more than a great way to boost your bottom line. It is true that you will likely enjoy increased productivity and higher profit margins by adequately training your employees, but it is also vital for safety. Workers who haven’t been trained on industrial machinery may make mistakes that could cost a company time and lead to legal action. An ounce of training is worth the expense when considering how much it can save in the end. Because of the expense of the product, it’s important to weigh your pros and cons. Here are some tips for packaging equipment training to make the most out of your packaging process. Onsite vs. classroom – Offering onsite training classes can often be far more beneficial than a classroom setting with documentation. Practical knowledge is what will drive competence and safety in the workplace. Ensure that all employees who will be working with a piece of equipment have a thorough understanding of its operation. Often, a combination classroom/onsite training class will be the best solution for your workers. The classroom will impart vital knowledge about equipment components, maintenance and safety procedures while an onsite demonstration will solidify that knowledge in trainee minds. Cross training – Making sure your manufacturing employees have a good understanding of several business processes protects the integrity of line times. If you can manipulate your line workers for different tasks, management won’t have to worry as much if someone has a sick day or is injured on the job. There will likely be someone available who can take over and continue. 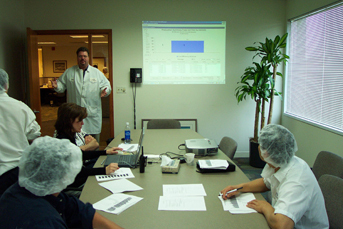 Metrics – When you begin any packaging equipment training program, make sure that you have some base numbers that you can compare after the training program. The only way to continually improve your process and become more efficient is to repeatedly analyze and change. Train your trainers – Your workers will only be as qualified as your trainers, so making sure that your trainers know your processes, equipment and training techniques will ensure that your workers receive the information needed for working. High Performance Packaging offers a complete onsite training program to improve work processes and protect your bottom line.